Laura Lee Hope is a pseudonym used by writers including Edward Stratemeyer, Howard and Lilian Garis, Elizabeth Ward, Harriet (Stratemeyer) Adams, and Nancy Axelrad. It was owned by the Stratemeyer Syndicate and should not be connected to any one author. 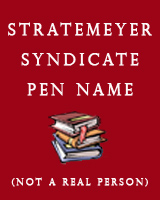 New books under that name are the property of Simon and Schuster. From Wikipedia: Laura Lee Hope is a pseudonym used by the Stratemeyer Syndicate for the Bobbsey Twins and several other series of children's novels. Actual writers taking up the pen of Laura Lee Hope include Edward Stratemeyer, Howard and Lilian Garis, Elizabeth Ward, Harriet (Stratemeyer) Adams, and Nancy Axelrad. Laura Lee Hope was first used as a pseudonym in 1904 for the debut of the Bobbsey Twins. Laura Lee Hope is currently considered a "single author." If one or more works are by a distinct, homonymous authors, go ahead and split the author. Laura Lee Hope is composed of 19 names. You can examine and separate out names.